Multi-instrumentalist David Franklin hears music and rhythm patterns everywhere in his day-to-day life whether it is machines, telephones, a vacuum, vibrating objects, a door closing or a baby crying; he uses these "found sounds" as inspiration or even directly in his compositions. In addition, whether playing piano, guitar, synth or percussion, Franklin usually is not content to simply pick up an instrument and make traditional notes and melodies, but instead enjoys manipulating the music by trying unusual tunings, using reverb or distortion, recording the sounds backwards, or playing the instrument in an unorthodox style. All of this and more comes into play on Franklin's latest recording, Songs of Potential Embrace, an eclectic collection of 16 pieces that could be categorized as new age avant-garde. "I like sounds and I have been playing with sounds all my life," explains Franklin. "I started out as a drummer, and I have always been a person who hits different objects just to see what it sounds like. Or I might spot a construction site, stop my car and go sing into an 40-foot pipe to find out what it does to my voice. It's like there is a symphony of sounds going on around us all the time, and I often collect the sounds I hear by recording them on my phone or another device. When I finally heard artists like John Cage and Steve Reich I realized I wasn't crazy when I was hitting garbage-can lids and pipes. My guitar playing was hugely influenced by Michael Hedges because of the different tunings he used, and I found that open tunings, for example, push me to explore different places musically." Songs of Potential Embrace is David Franklin's ninth album. He began as a folk-pop singer, did a Christmas solo piano album, released an experimental avant-garde recording geared to induce trance-state healing, and most recently released a successful instrumental melodic new age album (Playing With Shadows) which also featured renowned fretless bassist Michael Manring. That album spent two months in the Top 10 of the international Top 100 Zone Music Reporter Chart (the most important listing of successful new age recordings). Songs of Potential Embrace and other recordings by David Franklin are available as CDs and digital downloads through his website (DavidFranklin.com) as well as many online sales sites including iTunes and Amazon. Franklin believes music is one of humanity's most powerful tools for healing, and he hopes his music will help listeners connect to their inner feelings and ultimately create more of a sense of connection in their lives. Franklin, who also is a Licensed Marriage and Family Therapist in Northern California, says, "Music influences us on many levels, such as relaxing us, making us feel better, serving as a bridge that connects us to ourselves and others, helping individuals form a deeper understanding of life, and serving as a healing tool." On Songs of Potential Embrace Franklin brings together elements of "found sounds," avant-garde, new age and ambient music. "I like to explore some of the many different possibilities of music, and I don't like limiting myself in creating music. The idea behind the album title is really asking the world a question. Can all the people of this planet try to understand our connectedness, and accept each other as part of humanity rather than rejecting one another because of religion or politics or anything we don't agree on?" The music includes new compositions, several tracks created specifically to accompany performances by a San Francisco dance troupe, and a couple of tunes originally on Franklin's avant-garde Shadowlands album that have been reworked and remixed. Several pieces are only acoustic piano -- "Mourning in America" ("I haven't given up on America, but I am saddened by many things that have happened in our country"), "Inbal's Theme" (a very slow, sparse, ambient tune created for a woman dying of cancer), "Shade and Shadow" (overdubbed piano about which Franklin says, "I like it when the music challenges me"), and the companion piece (also with two piano parts) "Shade and Darkness" ("I went to Italy last year and played this live while a dance troupe performed in this ancient square"). A couple of tunes are all synthesizer -- "Whirling," "Ambient Fog" and "Xas10Shl (existential)" -- and one, "Allowing," combines piano and synth. Other music on the album features both piano and guitars. Regarding "The Failed Experiment of Consciousness," Franklin says, "Global warming and climate changes are issues I am very concerned about, and I am cautiously hopeful the human race will wake up and rectify some of these uncomfortable truths." On that tune he uses an acoustic baritone guitar with altered strings and an alternative tuning, and he adds some electric guitar toward the end. Another piano-guitar piece is the melodic "So Far Below" which uses the same altered baritone guitar and which was written in a cemetery. The more experimental, avant-garde material on the recording includes "Calling" which uses a telephone ringing as a rhythm pattern behind an out-of-tune piano from the 1800s, a plucked violin and wordless vocalizing. "Piece for Vacuum and 3 Voices" uses a vacuum as a background drone sound with the voices capturing the feeling of music from India including a rhythmic tabla-like part. "RH Factor" features a backwards guitar and a baby crying ("The sound of a baby crying resonates deep within us biologically."). "Swamps of New Jersey" includes an Udu (an African hand percussion pot) recorded backwards, bass notes from a harp guitar (some bowed), water sounds from a drum with ballbearings inside, and stream of consciousness vocals. "Quotes" is comprised of snippets of conversations with troubled teenagers mixed with unusual guitar sounds -- a guitar lightly bumping against a shelf, a clicking sound from an electric guitar and purposely "cranked distortion." "The Wildness" is a 57-second tune containing singing bowls and Franklin reciting a poem. Franklin was born and raised in New Jersey. In the fifth grade he discovered drums, in sixth grade he picked up guitar and started writing songs, and in high school he was also playing piano and singing. He played drums in rock bands through high school and college, while earning a Bachelors degree in Environmental Science at Pennsylvania State University. While at college he also performed as a singer-songwriter. 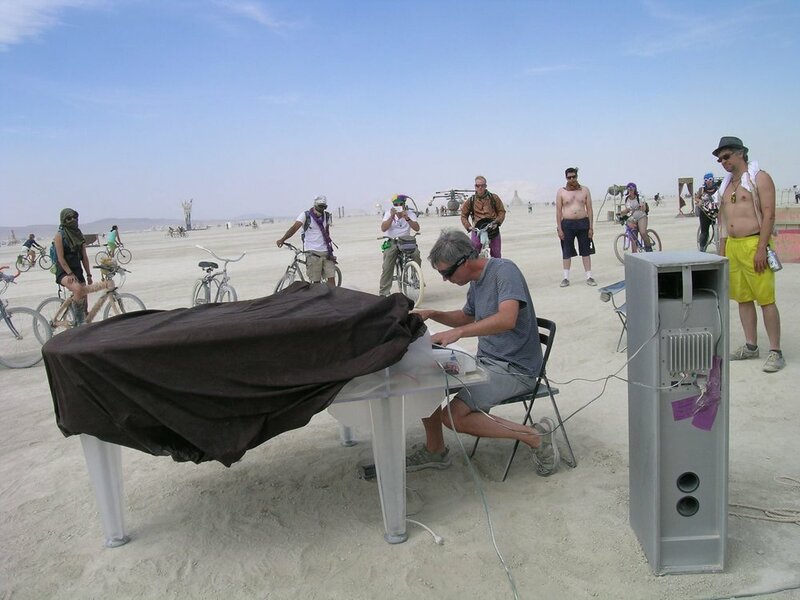 After college he worked in New York City for three years using his environmental degree and taking air samples inside office buildings while also playing keyboards in a rock band. Wanting to make more of a difference by calling attention to environmental problems and solutions, Franklin took a year off to join 90 other environmentalists in The Global Walk for a Livable World, a year-long hike across the country. Along the way they spoke at schools, to the media and to politicians. Franklin wrote and recorded songs throughout the trek, and that music was released as an album, Our Children's Only Home. The albums that followed also were primarily vocal folk-pop projects -- such as Patterns Yet Unknown and Strangers and Angels. Franklin also did a solo piano album called Traditional Christmas Melodies. Additionally he embraced avant-garde, experimental music with Shadowlands, his first venture to explore "found sounds" (such as the rhythmic sound of computer printers). Franklin later returned to college and earned his Masters in Counseling and went on to become licensed as a Marriage and Family Therapist, specializing in working with teenagers and men, and often incorporating music into his work. "Music can be a powerful healer and an important soundtrack as we access and understand the deeper parts of ourselves," Franklin says. "Ultimately I hope this music helps some listeners experience a sense of connection to themselves and to others." David Franklin believes that music is one of humanity’s most powerful tools for healing. Having recorded numerous albums as a singer-songwriter, the eighth recording by this guitarist and pianist is the instrumental Playing With Shadows which features Michael Manring on much of the recording. Released in 2015, Playing With Shadows was nominated for several awards and spent 6 months in the top 100 on the international Zone Music Reporter chart; 2 of those months, in the top 10. It was also listed as Top 30 Albums of the Year by ZMR and featured on Echoes syndicated radio broadcasts, as well as receiving much airplay on a multitude of stations, both in the US and abroad. 2017 finds David actively involved in various musical projects, both writing and recording new and eclectic music, for dance performances and film. He recently returned from performances in Italy. Franklin has had a varied career. He supported himself in college as a rock and roll drummer, became a keyboardist in a rock band in New York City for several years, toured and recorded as an acoustic guitar-playing singer-songwriter, recorded an avant-garde album featuring “found sounds” (such as vacuum cleaners) and, as an environmentalist, spent a year walking across the country to help raise awareness of environmental issues, all the while performing music. Playing With Shadows contains solo performances, duos and trios. There are 18 original songs and Franklin plays piano on 15 of them (seven are solo piano pieces). He plays acoustic guitar (always in non-standard tunings) on five of the pieces. Three compositions have Franklin on both piano and guitar. In addition, ten of the tunes feature Franklin’s friend and neighbor Michael Manring, considered the pre-imminent bass-player in new age music with credits including Michael Hedges, Alex deGrassi, Will Ackerman, Montreux, the Turtle Island String Quartet and countless others. Manring plays electric fretless bass. On one of the album’s songs, Franklin duets with accordion-player Rick Corrigan (a member of the popular San Francisco Bay Area group The Pick-Pocket Ensemble), and on another Franklin and Manring are joined by Franklin’s son, electric-guitarist Alex Franklin (a member of the recording rock group Water fly Spigot). Playing With Shadows and other recordings by David Franklin are available as CDs and digital downloads through his website as well as many online sales sites including iTunes and Amazon. Several of album’s compositions are placed side-by-side and serve as Part One and Part Two of a theme. “Shifting Landscapes - Dawn” and “Shifting Landscapes - Dusk” represent “how music, journeys and life go through different stages and phases, evolving, shifting, changing.” Franklin says he came up with the titles for “Falling Slowly” and “Falling Fast” because “these are the kind of musical pieces that are easy for me to write. I just sort of fall with the music and let it carry me.” “Not Just a Walk in the Park” goes with “The Rabbit Hole” and the two melodies represent “an adventure I had with some friends when we got profoundly lost in a forest and wondered if we were ever going to find our way out.” “First Day of Autumn” and “Autumn Memories” are Franklin’s tribute to his East Coast upbringing when the leaves turn and it becomes obvious that summer is over (“new seasons, changes and transitions -- all part of life”). Regarding the tune “There Used to be Songbirds,” Franklin says, “I read an article that said many songbirds will be wiped out by climate change in 30-to-40-years, so this is my requiem for the future.” “Giza” was written in Egypt where Franklin was inspired by the huge pyramid of that name. “Living in Interesting Times” is “a play on words because the music radically changes time signatures again and again.” When his children were young he wrote the lullaby “Song for the Dreaming” to lead them gently into sleep. He says about the tune “Goodbyes” that “we say little goodbyes all the time, but this was written at a time when a lot of losses were happening to people I deeply care about.” The album ends, appropriately, with the pensive solo piano piece “A Final Song” that Franklin improvised in the studio (“It was a happy accident because I was testing sound levels, but the recording equipment happened to be turned on.”). David was born and raised in New Jersey. In he fifth grade he discovered drums, in sixth grade he picked up guitar and started writing songs, and by the time he got to the 11th grade he had added piano and voice to his musical arsenal. He played drums in rock bands through high school and college, while earning a Bachelors degree in Environmental Science at Pennsylvania State University. While at college he also performed as a singer-songwriter. After college he worked in New York City for three years using his environmental degree and taking air samples inside office buildings while also playing keyboards in a rock band. Wanting to make more of a difference by calling attention to environmental problems and solutions, Franklin took a year off in 1990 to join 90 other environmentalists in The Global Walk for a Livable World, a year-long hike across the country from Los Angeles to Washington DC and New York. Along the way they spoke at schools, to the media and to politicians. Franklin and some of the other environmentalists also performed music. Franklin wrote and recorded songs throughout the trek, and that music was released as an album, Our Children’s Only Home. The albums that followed also contained original compositions and were primarily vocal folk-pop projects -- such as Patterns Yet Unknown and Strangers and Angels -- although the recordings usually contained the occasional instrumental piece. Franklin also did a solo piano album called Traditional Christmas Melodies. One out-of-the-ordinary project was Shadowlands, an avant-garde album influenced by eclectic pioneers such as John Cage and Steve Reich, and geared to induce trance-state healing. The album’s experimental music contained the occasional voice or instrument, but primarily focuses on “found sounds” (vacuum cleaners, baby cries, computer printers). Franklin later returned to college and earned his Masters in Counseling and went on to become licensed as a Marriage and Family Therapist, specializing in working with teenagers, and often incorporating music into his work.